If you're like many of us in tech pubs, your company has already dipped their toes into the rapidly developing field of chatbots and voice. Or perhaps your company is already waist-deep in it and they've tasked you with creating new content on a new system procured specifically for chatbots. Or worse, they've begun hiring a new class of writer, called the UX writer, to develop chatbot content in some other department that copies and pastes content from your technical manuals into chatbot databases. Or perhaps none of this is happening yet, but you want to get ahead of the curve. Now what if we told you that you can source chatbot and voice content directly from your structured technical content? What if we told you that rewriting and restructuring your content for chatbots could make your content far more accessible for users in your traditional content delivery channels? What if we could show you that this evolution in structured writing was simply a continuation of our journey down the path to developing structured content for DITA and other topic-based architectures? 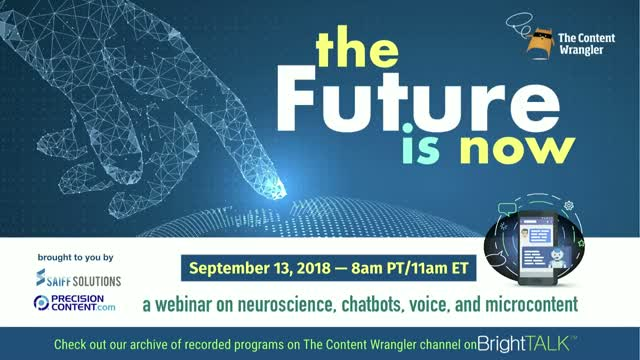 Join host, Scott Abel, The Content Wrangler, and his special guests Rob Hanna, President of Precision Content Authoring Services, and Barry Saiff, Founder and CEO of Saiff Solutions, as we introduce the concept of microcontent as a core component of structured topics.